My son Jack just turned five years old, and he requested a "Candyland" birthday party. We have a family party to celebrate, and since there are lots of cousins it is usually a fun time! 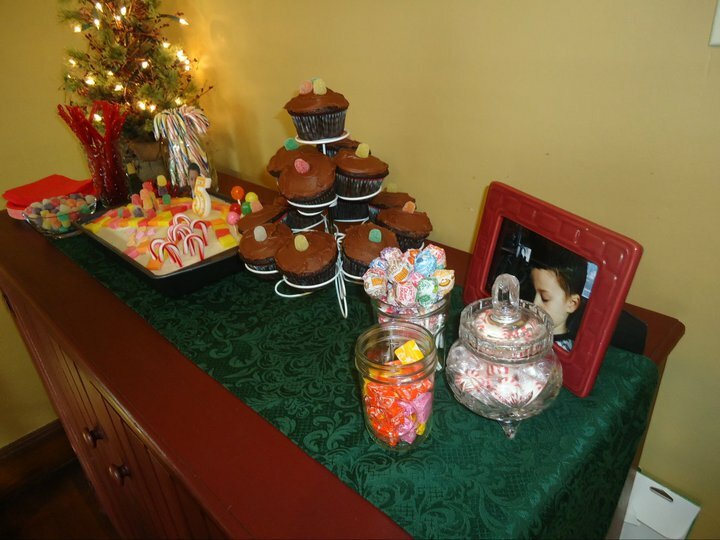 Candyland was an easy theme to work with, and really lent itself well to decorations and games. Candy canes and gingerbread men are big components of the game and I was able to score some great deals after Christmas on some of these items. This might look complicated, but honestly it was very easy and afforable. I did the preparation mostly the day before, with the exception of the favors and the big candy decorations hanging from the ceiling. First, we made a walkway using construction paper placed in sheet protectors. This was cute because it looked like the game board spaces. The sheet protectors were taped to the floor with double sided tape. They didn't stay down very well once they got "run" over by the kids. I probably should have laminated them to hold up better. I decorated solid color party hats with the characters of the Candyland game. I found a file here on google images that included the characters, printed it out in landscape format, cut, and taped onto the hats. I also did the same on brown lunch bags and wrote each kid's name on one for them to use to keep their prizes in. See Mr. Mint? Other characters were King Kandy, Princess Lolly, Gramma Nutt, Lord Licorice, Queen Frostine, the gingerbread people, Jolly and Gloppy. We had an older Candyland game that was headed for the trash because it was missing some pieces and the game board was ripped. 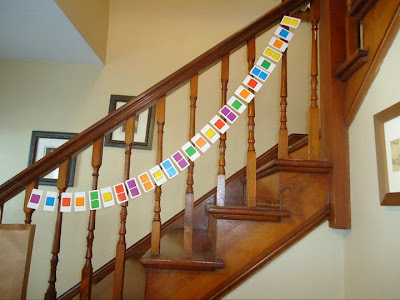 I saved the cards and made a garland for the staircase by sewing them together in a strand (I left about 1/2 inch in between each card). This took less than 10 minutes to make. I doubled my cards so the garland was two sided. My favorite decorations were the giant candies hanging from the ceiling. They were really easy to make using cardboard circles (traced mixing bowls upside down to get different sizes), cellophane and curling ribbon. I read about this idea somewhere on this site, which I can't seem to find the exact link now. Adam made clear tags on the top of the candies using packing tape, punched a hole in the clear tag and tied the curling ribbon through the hole and then taped the other end of the ribbon directly onto the ceiling. 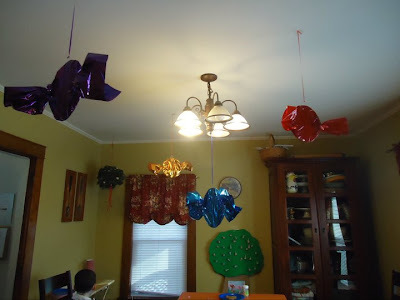 We had eight candies in various sizes hanging throughout the dining room and living room. I am not sure the pictures do these justice...the cellophane really sparkled and shined. We set out our Candy Land Castle Game and the new edition of the Candyland board game for extra props and for the kids to play with. 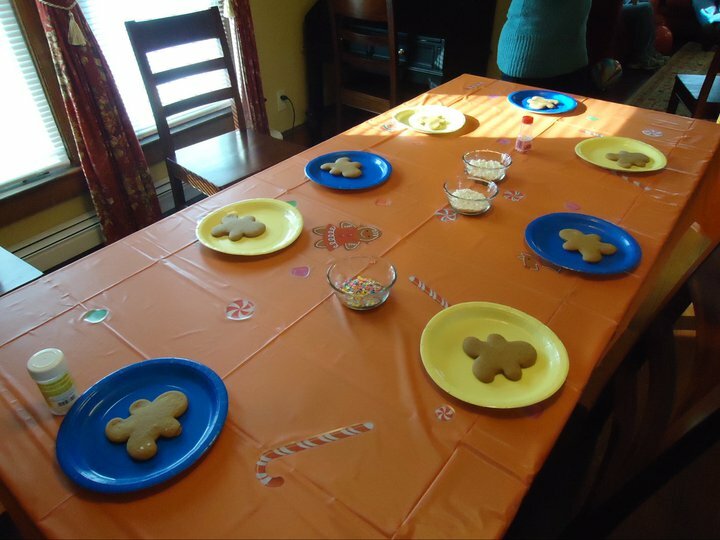 The first thing we had the kids do when they arrived was to decorate gingerbread cookies. I spruced up a dollar store plastic table cover with Christmas wall stickers that I got on clearance after Christmas. There were stickers of peppermints, candy canes, gumdrops and gingerbread people. They were perfect for our theme. The kids had a great time frosting and decorating their cookies. I had clear plastic bags to package up the cookies to take home that were not eaten right away. Our first game was made possible by Gramma Nut (aka Nanny Maine). She made some great little peanut shaped bean bags (since Jack is allergic to nuts, but you could use real peanuts for this game if you don't have to worry about allergies!). 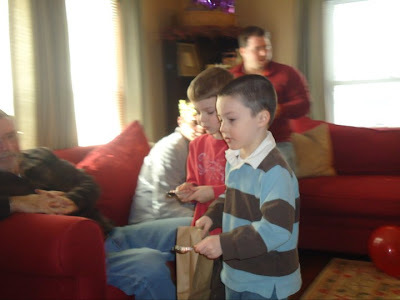 The kids had to throw the bean bag nuts into Gramma Nut's basket. She made it a little harder for the older kids. 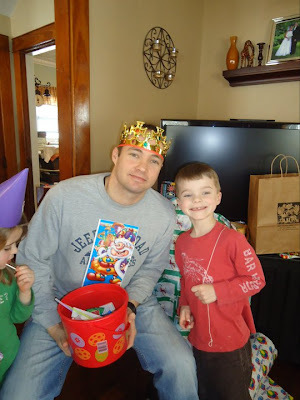 My husband was "King Kandy" complete with a crown and a picture of King Kandy taped to his shirt. He was in charge of handing out the prizes. What a good guy! 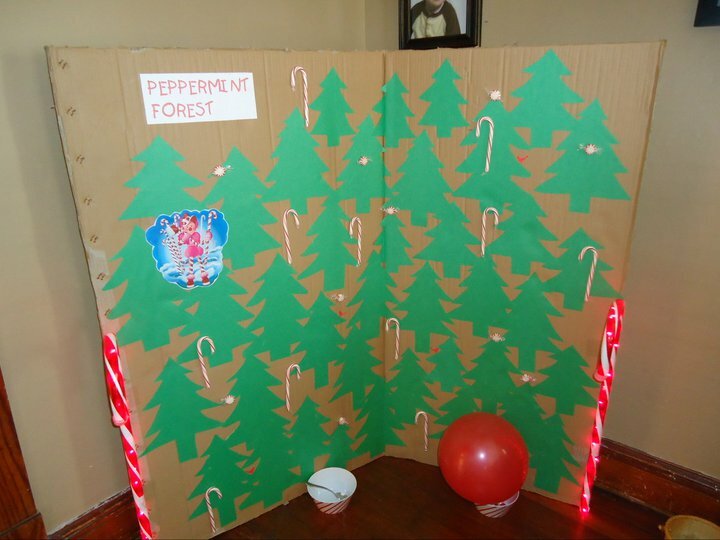 Peppermint Forest looks time consuming but it took me less than one hour to make. I had a large cardboard box that I used as the backdrop. I cut out green pine trees (free handed and cut in stacks - probably 8-10 at a time) from green construction paper. I used a glue stick to attach them to the forest. The starlight mints and candy canes were attached using Glue Dots . They are great because they are super strong. I use them often for all kinds of craft projects. I found a picture of Mr. Mint online and placed him in the forest, along with a few random birds on the trees. The candy cane lights were another great find in the Christmas clearance stuff. We attached those to the scene with clear packing tape. 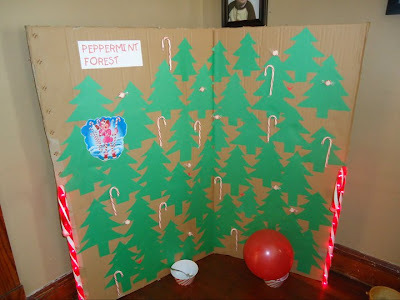 The kids did a peppermint on a spoon relay race to "give Mr. Mint back his peppermints!" It was fun to watch them playing this game. Princess Lolly is a favorite from Candyland but I didn't have the energy to make Lolly woods after doing Peppermint Forest so we settled for a lollipop tree instead. 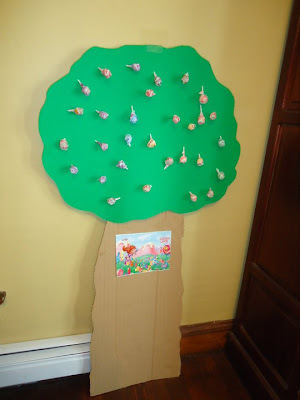 This tree was super easy and fast to make using a cardboard tree trunk and green poster board top. I poked holes in the top and put lollipops in to fill it up. We just let the kids take them off, but if you wanted to make this a game you could color the bottoms of a few of the lollipops and let those kids who have the colored bottoms claim prizes. Here was the kids favorite - all the candy! We had the cake (and cupcakes in case there wasn't enough cake) and clear jars, bowls and glasses filled with extra candy. Here is the cake - wacky chocolate cake (no eggs!) and frosted with my favorite buttercream frosting. I decorated the top of the cake to look like a miniature version of the Candyland game board. It was so cute to see Jack's face light up when he saw me putting all the candy on it. Growing up my mom always put a picture of us (taped to a toothpick) on our birthday cake. She saved all the pictures on a bulletin board in the kitchen for years. It was a fun tradition that I like to do now with my boys. This poor asthma boy couldn't get enough breath to blow out his candles - it took him a few tries! Since we had plenty of sugar (cookies, candy, and cake) during the party I wanted to make the favors sugar and carb free (for my diabetic niece especially). I thought it would be fun to make homemade gingerbread playdough to give the kids. I found gingerbread cookie cutters on clearance after Christmas. This was fun to make, and it smells amazing! I had to experiment a few times to get the right combination of spices but it turned out well (recipe below). 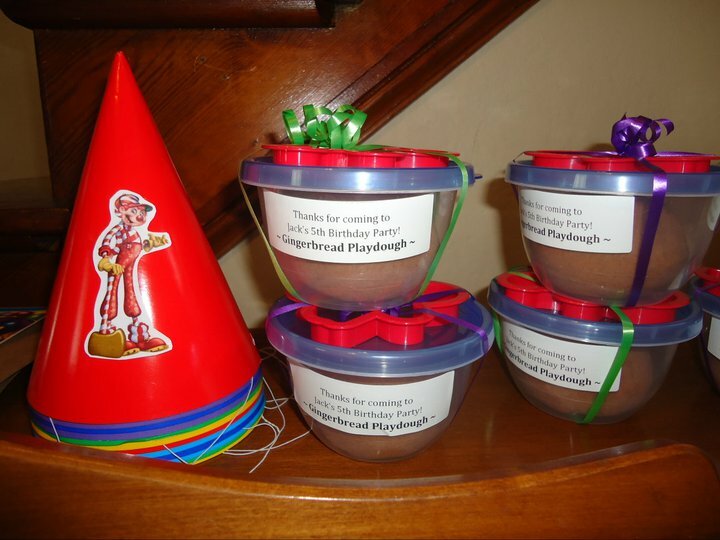 I packed the playdough in small plastic containers and tied a cookie cutter to the top with ribbon. The green ribbon containers had gingerbread "boy" cutters and the purple ribbon containers had gingerbread "girl" cutters. I made labels for the sides to finish them off. Mix together the flour, salt, cream of tartar and spices in a medium saucepan (off the stove). In a measuring cup, mix together the water and oil and then add to the dry ingredients. Once combined place pan on stove over medium heat. Cook the mixture for three to five minutes on low/medium, stirring constantly. The dough will start to pull away from the sides of the pot and tick together in a large ball. I take it out of the pan when I see a faint brown skin on the dough one each side when I flip it. Take the dough out of the pan and knead the dough on a well floured surface until it becomes soft and smooth. The extra flour will help decrease the stickiness of the playdough. Add one tablespoon of extra flour at a time, until the dough is playable and not too sticky. Allow the dough to cool and then store in an airtight container. This playdough smells great!!! My boys have loved playing with it, especially using their gingerbread cookie cutters. 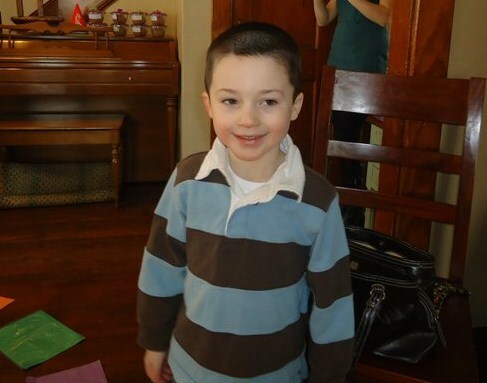 This was a very fun party to put together and my son Jack loved every minute of it. He was smiling all day long. I know this will be a day he will always remember! wow! love planning birthday parties and i love all your details. nothing was missed! you did a great job. What a great party! I love everything you did! Parties have moved on tremendously since I was a kid. Man, even I would have had fun at this wonderful party! S & K had so much fun. Everything looks really good and so well thought out! Sometimes the easiest detail makes the biggest impact (like the candies from the ceiling). What a lovely theme n depiction ... loved going thru ur wonderful blog !!! I think I got here from Money Saving Mom (I get all turned around in blogland, lol!) to see the cute painted cans. I love it! Where did you get the pic's of the characters? I love that you posted the link to the pictures. 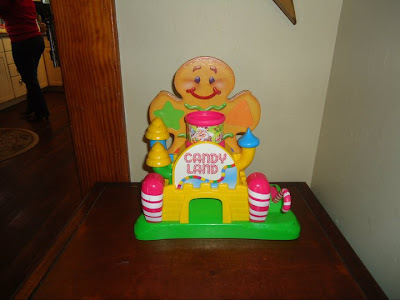 I have been planning a Candyland party for my daughter for weeks and haven't been able to find any decent images. Thank you, thank you, THANK YOU! This was a really fun party to do, thanks for all the comments and feedback.